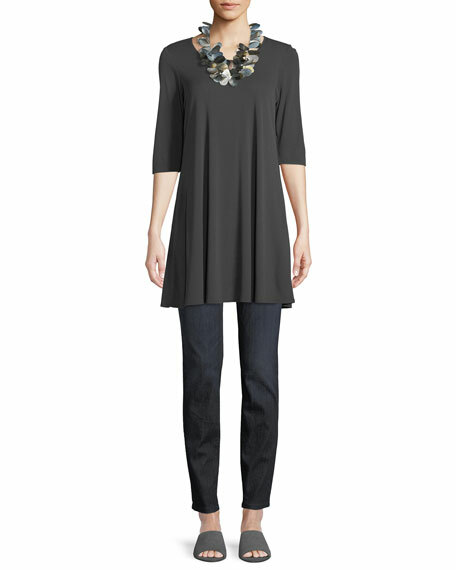 Eileen Fisher soft stretch-denim jean leggings. Faux fly and faux-pocket styling. Fitted through the seat and thigh. Cushnie Et Ochs leggings in two-tone performance fabric. High-rise; wide waistband. Second-skin fit. Ankle length. Pull-on style. Nylon/spandex. Made in USA of imported material. Model's measurements: Height 5'10"/177cm, bust 33"/84cm, waist 25.6"/65.2cm, hips 35.8"/91cm, dress size US 2-4/FR 34-36. Lanston "Foster" leggings with self-tie hem. Wide waistband. Second-skin fit. Capri length. Pull-on style. Polyester/spandex. Made in USA of imported material. Model's measurements: Height 5'10"/177cm, bust 33"/84cm, waist 25.6"/65.2cm, hips 35.8"/91cm, dress size US 2-4/FR 34-36. Onzie "Sporty" printed leggings. Angled contrast mesh inserts. High-rise waistband. Second-skin fit. Full length. Pull-on style. Polyester/spandex. Made in USA of imported material. Model's measurements: Height 5'10"/177cm, bust 33"/84cm, waist 25.6"/65.2cm, hips 35.8"/91cm, dress size US 2-4/FR 34-36.